Snowy doorways on Commonwealth Ave. I like the twins buildings in different colors!And I love the trees with snow on their branches, they're so beautiful! It's beautiful with the snow! Nice image, Clueless. The Back Bay must be beautiful in the snow. This pair of buildings is interesting. 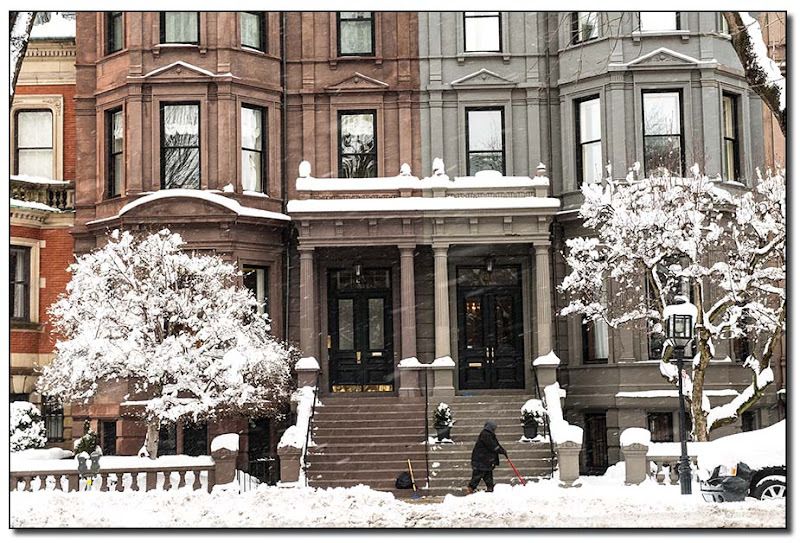 I am guessing the one on the left is the original brownstone, and the one on the right has been painted? Great symmetry! I'm also intrigued by the different colour of the houses, I must say. They look like they're made of different kinds of stone. I hope it is nice and warm inside.